An NHS watchdog is taking too long to assess cancer drugs which could potentially save lives, a charity says. CancerBACUP warned patients could die waiting for the National Institute for Health and Clinical Excellence (Nice) to complete deliberations. The charity is concerned that budget cuts, which have forced the closure of one of the three appraisal committees, will further slow the process. Nice said it was crucial that new treatments were properly assessed. Among the treatments flagged by CancerBACUP in its "dossier of delay" is Herceptin. Trials suggest the drug could be of great benefit for women with early stage breast cancer. But according to the charity, it could be 2009 before the treatment is widely available on the NHS under the current appraisal process. The charity is calling for the Nice to introduce a system of fast-tracking for cancer treatments which have shown significant results. On average treatments take a year to go through the appraisal process, although some cancer drugs can take up to two years. Nice guidance on colon cancer treatment Eloxatin, which can give a 23% reduction in the risk of the cancer returning within two years, is not due until May 2006. And guidance on Cetuximab for head and neck cancers, which can give a 7% increase in survival rates over 2 years, is not due until June 2007. CancerBACUP chief executive Joanne Rule said: "When people read about these treatments in the newspapers, they ring us up wanting to know how soon they will be available. "Sadly, we have to tell them that it could take years before they are widely available on the NHS. "For many, that could be too late. We have to find a way of speeding up the time it takes for Nice to approve all cancer treatments and introduce a fast-tracking process for exceptional cancer treatments. "These delays compound existing problems of post code prescribing of cancer treatments which we have highlighted in the past." Nice issued a statement in which it said claims of delays were misleading. In particular, it said Herceptin was not currently licensed for the treatment of early-stage breast cancer, and so Nice was not in a position to consider the drug. Andrew Dillon, Nice chief executive, said the decision to scrap the third appraisal committee would extend the assessment process for some treatments by around four months. He said: "Whilst we are aware that for many cancer patients time is of the essence, we feel that it is important that we do not rush decision on drugs that have the potential to improve the quality of life for thousands of patients over many years. "A rushed decision without considering all the evidence could result in a less favourable appraisal of these drugs, and therefore fewer patients benefiting in the longer term." Mr Dillon said there was no ban on prescribing drugs that had not been appraised by Nice. 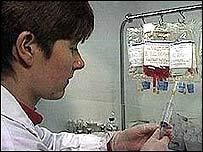 A Department of Health spokesman said: "Treatments should not be withheld because guidance from Nice is not available. "In these circumstances we expect clinicians to take full account of the available evidence when reaching decisions on patients' treatment." Is anyone listening to NICE?